The HIV-1 virus is about 120-150 nm in size and has a genome only about 10,000 base pairs long. Other viruses are far more efficient, for example lambda phage has something like a tenth the volume and a genome five times longer. In other words, while half the volume of a lambda phage is taken up with DNA, in HIV it's more like 1%. Why is HIV so space inefficient? There are many other things inside the HIV capsid besides RNA. The ssRNA is bound to the p7 nucleocapsid protein, the p6 late assembly protein, as well as integrase and reverse transcriptase, both of which are vital for infectivity. 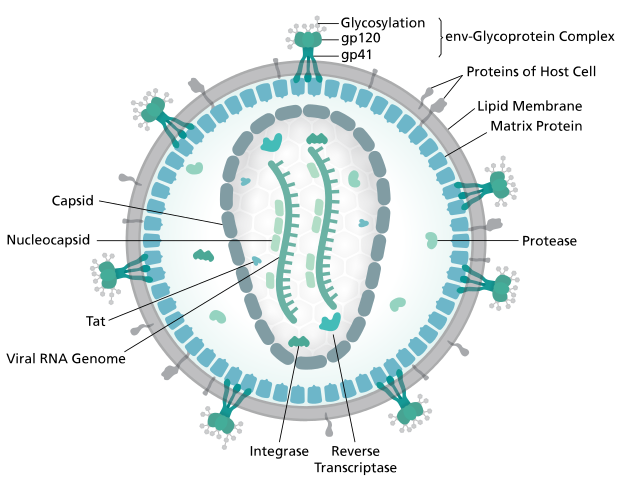 Also enclosed within the virion are Vif (Viral Infectivity Factor), protease, Nef (Negative Regulatory Factor), Tat (HIV Transactivator), and Vpr (Viral Protein R). Surrounding the capsid is a matrix formed by the p17 viral protein, and finally the lipid membrane envelope (taken from the host cell upon budding), which contains host cell proteins as well as the vital trimer of gp120/gp41 heterodimers, which bind to the target cell. HIV (and many other viruses) depend on binding to certain cell surface receptors, and a larger total size increases the chances of binding to multiple receptors and potentially triggering receptor-mediated endocytosis, if that is part of the virus's entry strategy. The naked λ phage binds to the lamB porin of single-celled prokaryotic E. coli by way of the phage's J protein and injects its DNA load into the bacterium, where host factors circularize and supercoil it, allowing for transcription to begin. 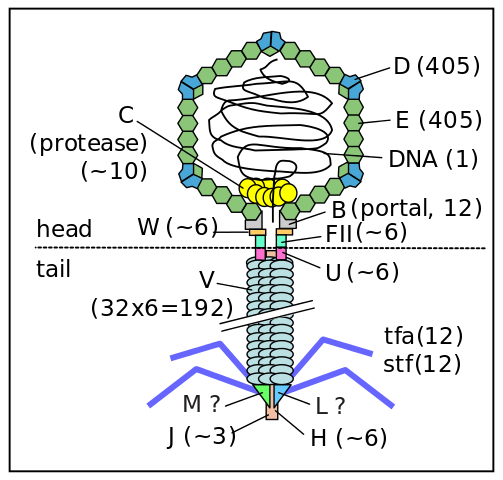 While the phage's genomic material can be integrated into the host's chromosome, it is not required. Additionally, there is no nuclear barrier to cross. From Wikimedia, numbers in parentheses are copies per virion. On the other hand, HIV is a highly complex enveloped lentivirus that targets very specific cells in its multicellular eukaryotic host HIV requires reverse transcription and the assembly of a large pre-integration complex to transport the viral DNA into the nucleus and integrate it into the host's genome, all before it can even start producing new viral proteins. Trying to compare the "packing efficiency" of HIV to the λ phage isn't just comparing apples to oranges, it's comparing apples to goats. The two viruses are completely different, with the only essential similarities being that they are viruses that infect cells. First, your idea that "efficiency" has some relation to "genome size" divided by "diameter" is odd. You end up with arbitrary numbers that are not any kind of measure of "efficiency". Second, HIV is an enveloped virus, while lambda phage is not; the internal viral core, less than half the size, is a better comparison. Other enveloped viruses like influenza (100 nm, 14000 bp) are in the same ballpark. Even many non-enveloped viruses, like Tobacco mosaic virus (40x300 nm, 6400 bp) have similar or "worse" ratios than HIV. But the most important point is that it doesn't much matter. It's not a measure of any kind of "efficiency" in the biological sense. Not the answer you're looking for? Browse other questions tagged virus hiv retrovirus or ask your own question.